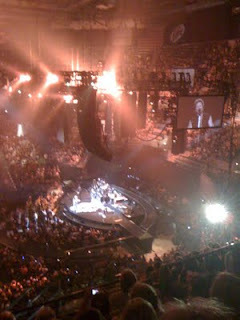 My wife went to Bon Jovi last Saturday and her friend sent this picture. It reminded that it's been a very long time since I've been to an arena for a concert. I've been to a fair number at the Marcus Amphitheater, but that's outdoor, so really doesn't count. I'm talking about the hockey arena venues that are acoustically awful. Nothing like steel and concrete to muddy the words of a searing vocal solo. Throw in the echo factor and well, you get what you get, unfortunately. Now this is not to dis arena rock entirely. Some of my best concerts have been at arenas. Santana in 1981 was one of those. I had great main floor seats at the old Met Center in Mpls, before they tore it down. Of course Carlos Santana could play in a subway and sound phenomenal, so I guess that counts for something. The other thing that made that show better than most arena shows was the fact that I was on the main floor, like 15 rows back or so. Being that close tends to make the echo factor a bit less annoying. It's when you're in the nose bleed seats and the band all look like they're 6 inches tall that you wonder why the experience is any better than the album. That's not to say the main floor is always a perfect acoustic experience. I managed to land main floor seats for the Rolling Stones on their Tattoo You tour in '81 also. Great seats, too dang loud! The saxophone drowned out everything on a couple of songs. It was a good show, just not their best. As I recall, by the time it was done, so was I.
I went to most of my arena concerts at the St. Paul Civic Center. It was more of the same. Designed for hockey and conventions primarily, it was not a great musical venue. Again, some good (Eric Clapton, who I saw there 3 times) and some not (ELO). ELO happened to be my first concert in 1978, and I still say it was the loudest. They put on a phenomenal stage and laser light show, true cutting edge stuff, but something with the string instruments, combined with too much volume and the venue itself, and it was just OK. I've never been to a show at the Bradley Center in Milwaukee, but I'm guessing it's probably very similar to the Met or the Civic Center. I can say too that all of my outdoor concert experiences have been positive. Alpine Valley is a perfect place for a show. Saw the Grateful Dead there as well as Eric Clapton and Mark Knopfler. There's something softening about being outdoors where the music just takes on a life of it's own. As the wind blows, the notes change and carry differently. Good stuff. I've even been to a couple good shows at the MN State Fair (Rod Stewart, Kansas). All of this was spurred by my trying to remember the last arena rock concert I'd been to, and I think it was Eric Clapton at the Civic Center during his August tour in 1986. A great show too. I think going back to an arena rock show sometime has become a new bucket list item for me.